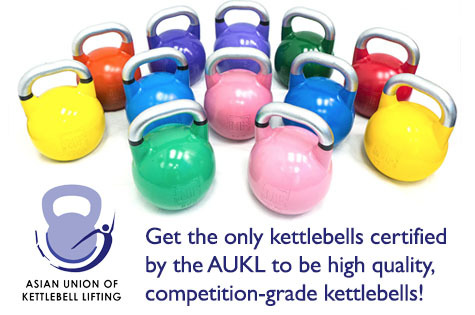 As the first company in Singapore to bring in kettlebells, we supply high quality kettlebells manufactured to the standards used at Regional Competitions, multi-chain gyms, CrossFit boxes and MMA centres. Our kettlebells have received good feedback across all customers. A kettlebell is a long term purchase. Get the best-in-market and have no post-purchase worries. Our kettlebells match standards from international bodies in terms of handle diameter, kettlebell height and width, material and chalk adherence. In addition to meeting high competitive standards, our kettlebells are made using top-quality materials - Rust-proof steel and Impact resistant paint. Order online and receive your order within 3 working days! We provide free shipping for orders above $150. If you have any questions, drop us an email! Wait no further! Get your kettlebells directly from our Online Store now! You can pay hassle-free using Cash during Delivery. You can also learn more about the benefits of Kettlebell Training here. Click here to buy directly from our Online Store! Only CASH accepted at Showroom. No NETS or Credit Card.